We are a boutique exotic stone showroom featuring the most rare and extraordinary stone to be found. 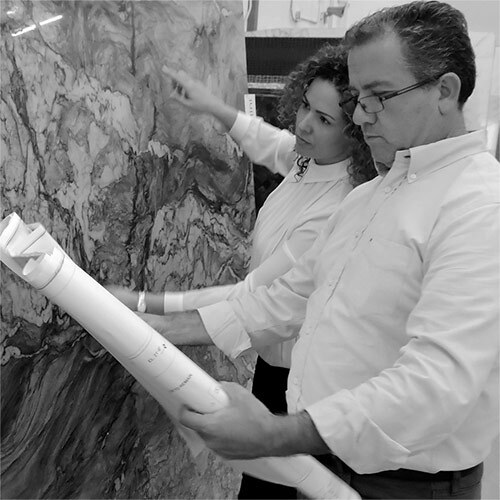 Nature of Marble is a boutique exotic stone importer founded in 1999 by Hass and Rana Sweid. Their business was born from a love of nature and the remarkable beauty of natural materials. For two generations (and a third in training), the Hass family has specialized in sourcing the very finest natural stone from virtually everywhere in the world. As the principal buyer, Hass often travels twice a month to quarries all over the world to personally inspect and hand select the exotic stone that ends up in his showroom. His business relationships with quarry owners span decades and are built on a foundation of integrity and trust. Just as important, Hass works directly with the world’s finest stone cutting and finishing factories in Italy to maintain the highest quality standards. These state-of-the-art facilities in Italy use the most precise and advanced cutting and finishing technology and materials available in the industry. Buying exotic stone countertops and flooring from large corporate entities simply is not the same. Nature of Marble offers a level of quality, selection, personalized service, product expertise, and customer satisfaction you just won’t find elsewhere. It is truly a boutique experience with a keen focus on doing what’s right for the customer. Nature of Marble is a preferred supplier to many of Florida’s leading interior design firms, custom home builders, architects, and home remodeling firms. In fact, over half of the company’s revenues are earned from trade customers that buy mainly from Nature of Marble. to many of South Florida’s top interior design firms. South Florida’s top contractors, developers and home builders. We’re experts at crating, shipping, and exporting exotic stone to anywhere in America … or to anywhere in the world. We have decades of experience expertly packing, crating, exporting, and shipping to virtually any address in the world. We can assist you with every detail so that your exotic stone material arrives on time and intact. and other trade professionals throughout the islands. New marble countertops are the main stage for preparing family meals at home. At Nature of Marble, we understand you have many options when choosing exotic stone. As the testimonials below will attest, we strive to make your experience at Nature of Marble the best it can be. Thanks to our many customers who take the time to write us and post online reviews. Your feedback helps us improve our business to better serve you. I’ve been doing interior design in Boca Raton Florida and surrounding areas for over 25 years. I have enjoyed working with the staff and management of Nature Of Marble for many years. I am extremely pleased with their service, with their variety of unusual stones, and their follow through. I have completed many large projects with both flooring as well as countertops over these many years and have absolutely been thrilled with all of the results. In this day and time it is difficult to find businesses that stand behind what they say and fortunately for me and my clientele this has always been the standard of excellence at Nature Of Marble! I cannot thank all of you enough! You have made this experience fabulous with your professionalism, wonderful eye for the clearest and pure stone on earth, and your attentive customer service. I am a certified kitchen and bath designer originally from New York. My standards are very high and my expectations even higher. I work with stone and know quality! My customers look to me to advise them and they want only the best. You are fairly priced and have the most beautiful and unique stone I have seen. Hass is knowledgeable and must travel to the ends of the earth to find the gorgeous natural works of art that you hold in your facility. It’s the most beautiful stone yard I have ever seen. Again, allow me to thank all of you for providing such a delightful service. Professional in every way. You were a pleasure to work with on every level. The service and materials were excellent. The granite is exclusive and marble unique and high quality. This is the place to get marble & granite. Your company had the best selection of granite & marble that I could find. Your sales representative was terrific with his help on selecting the granite. I am very happy with the granite and everyone who sees it thinks it’s fabulous. You guys did a great job and the final product is wonderful. It was great to work with you during entire process. I wanted to thank you for your wonderful service and prompt delivery. As the decorator on the job, I wanted to let you know how pleased I was and that I look forward to working with you on future jobs. You made me look good by your fair prices and by keeping your promises on the dates of delivery. You did a great job and was very professional & prompt. Thank you. I want to commend you for the beautiful job you did. Our kitchen looks just beautiful. I love it. My husband and I are delighted with our new kitchen. The granite design and color is just what we wanted. We appreciate your suggestions to help us make the right decision your entire organization is highly professional and skilled. I would highly recommend Nature of Marble and would be happy to be used as a reference. We just want to thank you again for being so accommodating with our schedule and for the wonderful job. Our counter, island 7 back splash are exquisite. You were such gentlemen & even came out on a Saturday for us. Everyone that sees our kitchen raves about the granite. We’re thrilled, too, and will definitely recommend you to our friends & family, Thank you again. Your Company was fantastic in every way! Great service & great quality! I LOVE my newly renovated kitchen….especially the granite! The stone we selected stands out, bar none. Nature Of Marble certainly had the best selection in the market. You were a pleasure with which to work on this project. Thank you very much! We shopped with you because our contractor recommended you. We were very pleased with the service we received. The salesperson listened to what we wanted and showed us granite that matched the need!